If you’re a #DCTV fan, you’re going to want to mark November 27, 2017 with a big X on your calendar. That’s the first day of this year’s four-part CW crossover…and it’ll find our heroes landing on Earth-X. 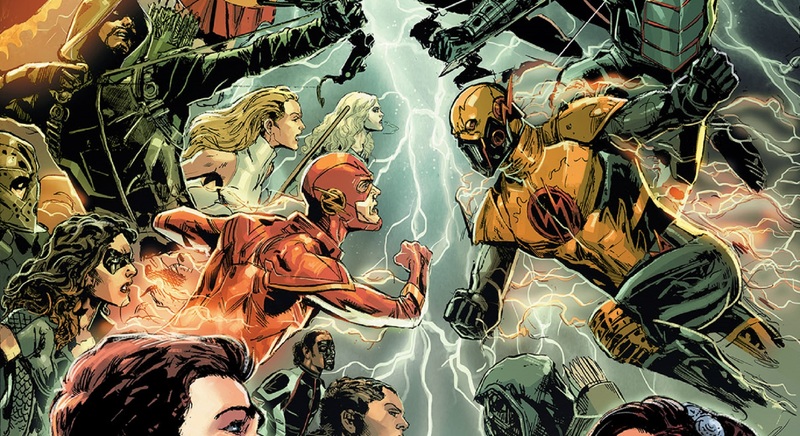 The CW and Warner Bros. Television announced today that this year’s crossover is entitled “Crisis on Earth-X,” a nod to the numerous “crisis” events held throughout the DC Universe since CRISIS ON INFINITE EARTHS introduced the concept of the Multiverse. To celebrate the announcement, artist Phil Jimenez, known for his work on WONDER WOMAN and SUPERWOMAN, was asked to create a custom comic book cover paying homage to DC’s longtime annual comic book crossovers. Unlike past CW crossovers, this year’s four-part crossover will air over two nights: Monday, November 27th and Tuesday, November 28th on The CW. Arrow will air on Thursdays this season, but for the crossover it will air on Monday at 9/8c after Supergirl, while the other DC shows will remain in their regularly scheduled time periods. Fans got their first look at the #DCTV take on Earth-X in the sneak peek of the upcoming Freedom Fighters: The Ray digital animated series that was released this summer, and it looks like the Ray will make his live action debut in the crossover. Also of note, the crossover looks like it’ll bring the long-awaited nuptials of Barry Allen and Iris West—provided the Earth-X attack doesn’t prevent them—who can be seen in wedding garb along the bottom of the poster. Expect more news on this sure-to-be-epic new crossover event as it breaks here on DCComics.com. But for now, sound off with your thoughts in the comments below!